Beautiful color RED…..COCHINEAL. What is it? A little bug lives on the nopal cactus and has babies that make a fuzzy cover for protection while they grow into mature adults. After they mate, the males fly away and eventually die, the mother is incubated in a little woven tubes. The babies crawl out and spread on the cactus while mothers then die and become the dye (carmenic acid) after they are dry. Many thousand of dry cochineal bugs make up a pound of dye. 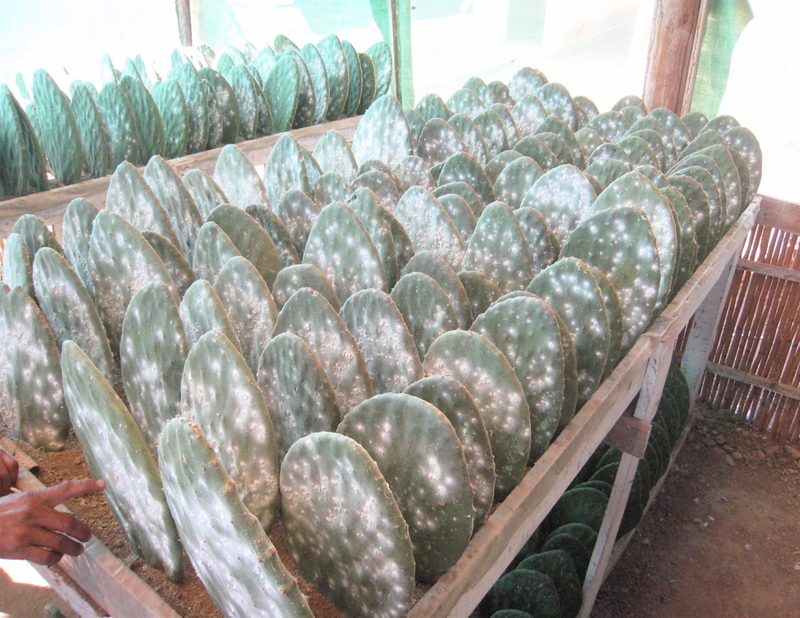 The nopal ‘paddles’ are the host for the cochineal bug and are harvested from the parent cactus and set in dirt as pictured at the Rancho Nopal Cochineal, a cultivation farm in Oaxaca. They can also be suspended on a frame as seen at Bii Dauu rug weavers studio in Teotitlan del Valle. The cycle takes about 3 months from incubation to full maturity, depending on the warmth of the air and season. Dried cochineal bugs are then ground either on a matate or in a coffee grinder. Different mordents, when added to the yarns or the hot dye bath, create different colors. Limon, an acid, creates a orange color and soda, an alkaline, creates a deeper red. 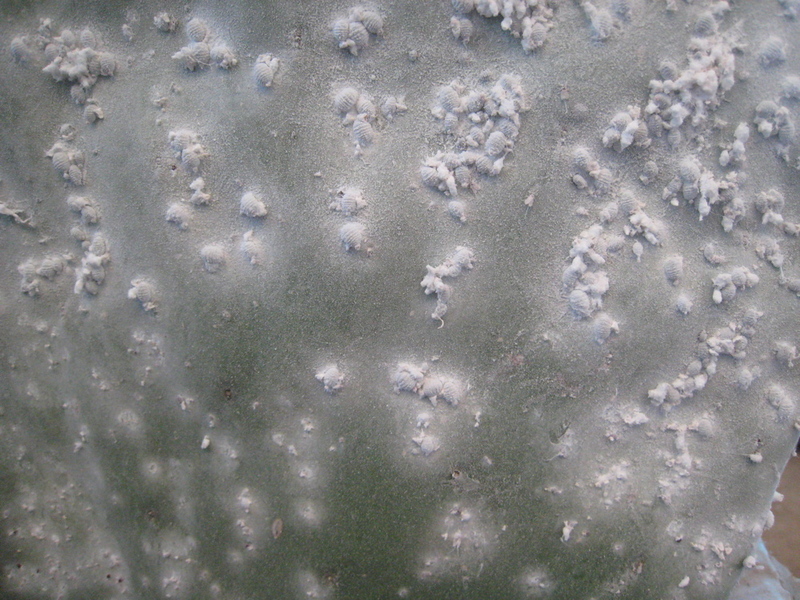 Cochineal can be seen in several indigenous garments below. A wool skirt from the Zapotec village of Teotitlan del Valle and a quechquemitl (cape) and a striped skirt from a Mazahua village – Santa Rosa de Lima, State of Mexico. Cochineal dyed garments stay vivid for a long while, as seem the bright pink Mazahua gaban (poncho) which is over 130 year old. This entry was posted in Clothing, Groups, Locations, Oaxaca, Photos, Rancho Nopal Cochineal Farm, Santa Rosa de Lima, Techniques & Fabrication, Teotitlan del Valle and tagged cactus, cochineal, cochineal farm, color, color red, dried cochineal bugs, enredos, gaban, indigo dye, matate, Mazahua, Mazahua costume, Mazahua quechquemitl, mordents, natural dyes, nopal, quechquemitl, skirt, Valle Central Oaxaca, Zapotec costume, Zapotec village. Bookmark the permalink. I am enjoying your Living Textiles of Mexico blog and your photographs of the Santa Rosa de Lima project. I would like to visit Santa Rosa de Lima sometime when you are there. Please tell me if this is possible. Hi Jim….I’m Sheri Brautigam and I’m posting the info on the blog. Send me your personal e-mail and we can correspond about Santa Rosa de Lima. You might find the current issue of the Metropolitan Museum of Art’s Bulletein, winter 2010, of interest. The entire issue is devoted to “Cochineal Red, The Art History of a Color.” It is filled with extensive information, bibliography, maps and photographs. Congratulations on a great blog. I just became aware of it and am very impressed. Very good information and photos. Keep it up! Hope al is well with you. Thanks Aldo – It’s a wonderful adventure – Mexico’s textile tradition….and so much to explore. Glad you are enjoying it….hope all is well with the gallery too. Can I use this picture in my book?